A Pentagon effort to enable a human journey to the stars within 100 years aims to enlist the brainpower of science fiction writers, ethicists and researchers. This new call for ideas covers innovations such as faster than light travel and life-sustaining technologies as well as questions about who gets chosen for the starship crew and what happens if alien life turns up at the end of the journey. This latest step for the $1 million 100-Year Starship Study would lead up to a space technology conference scheduled to take place in Orlando, Fla., from Sept. 30 through Oct. 2. 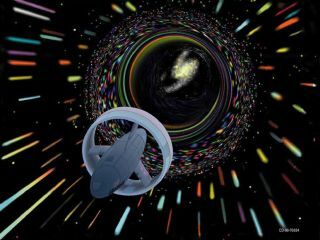 The new call for papers differs from a past request for proposals about setting up the organization that would lead the charge into the future of interstellar travel. "Verne couldn't have known about what was needed to go to the moon," said David Neyland, director of the Tactical Technology Office for DARPA. "That's probably where we are today in terms of the 100-Year Starship." Despite the challenges, DARPA sees the effort as a great way to focus research on a grand vision and create useful spinoff technologies along the way, Neyland said. It also encourages big thinking, as seen in a strategic workshop held by DARPA with prominent scientists and science fiction writers in January. One wildly futuristic idea came from Craig Venter, the scientist who led the private team that helped accomplish the Human Genome Project, when he proposed sending genomes out on the interstellar journey and allowing them to reconstruct at the end. Many of the solutions for a self-sustaining starship also have great practical use for U.S. military operations. Breakthroughs in energy storage and production might free U.S. soldiers from the risk of protecting fuel supply convoys that bring fuel to forward bases. "Clearly a starship would have to be energy neutral, and would not able to stop off at a gas station along the way," Neyland said during a teleconference. Similarly, the technologies needed to create an ecologically balanced starship that has self-sustaining water and food supplies could help tremendously on Earth. Figuring out how to make sustainable medical supplies aboard the starship would have similar benefits for both the military and civilians. "You can't go home to get prescriptions for antibiotics if someone gets sick," Neyland said. But big ideas won't happen without funding and long-term planning. By the end of the study in November, DARPA hopes to hand off about $500,000 of the original $1 million as seed money to a startup organization that can "carry the ball forward for us," Neyland said. That unknown organization may emerge from among the crowd of researchers and big thinkers who have responded to DARPA's call so far. About 150 individuals or groups already sent in responses to an earlier Request for Information that focused on how to create an organization that can sustain the 100 Year Starship vision. DARPA plans to issue a Request for Proposal on forming the organization later this summer. Perhaps the biggest current debate comes from the question of whether the organization should be for profit or a nonprofit. "The latter group says it should be completely philanthropic," Neyland said. "The former says that, to be self-supporting, you need to have return on investment for investors and researchers so they can bring the best to the table." Neyland hopes that people who have a vision for such an organization will also attend the Orlando conference in September, where the big thinkers are expected to gather to discuss all the technical details and challenges of creating a starship. Anyone with serious ideas for talks on papers or panels for the conference must submit their proposals to the 100 Year Starship Study by 2 p.m. ET on July 8. This story was provided by InnovationNewsDaily, a sister site to SPACE.com. Follow Jeremy Hsu on Twitter @ScienceHsu and get the latest InnovationNewsDaily news on Twitter @News_Innovation, or on Facebook.